A knowing smile, widening eyes, fidgety fingers. Those are just three of many ways to read someone's mood even if you don't know them at all. The other is by listening. Not to the things they say but the other sounds: low humming can reveal anxiety, a clicking tongue irritation and music can express just about anything. In the case of the West Indies team, it beats a ballad of bliss. The tunes seeping from their team room, through the walls in the bowels of the Newlands members' stand where the media conference venue is nestled, were upbeat and catchy, toe-tapping, hip-swaying sounds. They told not of a team who had been outplayed just two days ago, for the third time in as many matches, but of optimism and enthusiasm for what's to come. And Darren Sammy confirmed that is exactly how they feel. "We are generally a happy bunch of boys. We are moving forward. 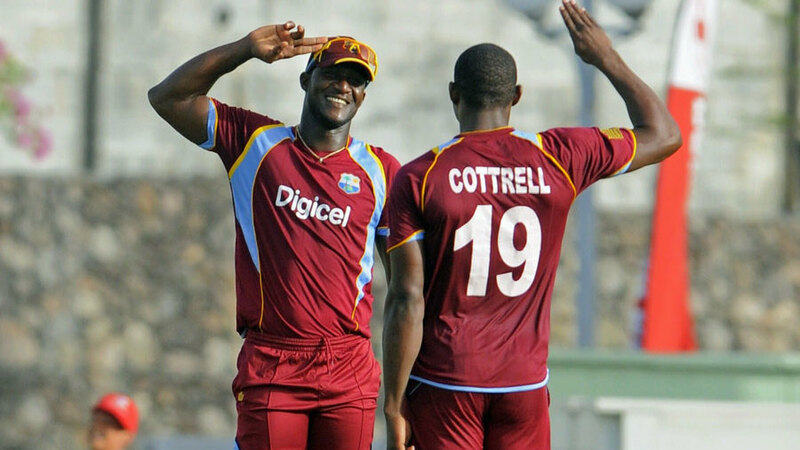 There's a new energy and a different calibre of players," Sammy, West Indies' T20 captain, said. Although five members of the Test squad that lost 2-0 to South Africa are part of their T20 outfit, West Indies have been bolstered by the arrival of their heavyweights for the shortest format. Most notable among them are Chris Gayle and Kieron Pollard but Andre Russell and Sammy himself will also attract attention. All four played in the most recent edition of South Africa's domestic T20 competition and are expected to be familiar with the type of cricket needed to be successful in these conditions. "We gained a bit of knowledge but at the same time it was a plus for the South Africans, who were able to get some information on us," Sammy said. "But we are very confident. We won a World T20 three years ago and we believe we have some of the best players in the world in this format." Faf du Plessis, Sammy's opposite number, agrees and happily stuck the underdog label on his own men. "They are full of match-winners so it will be really for tough for us but that's how we want it," du Plessis said. "We want our guys to compete against the best in the world." Although West Indies have dipped since being crowned champions in 2012, they remain a formidable short-format side and du Plessis identified their batsmen as the biggest threat. "They have got guys who come in and put you under pressure and that's the hardest thing as a captain," he said. "When you get a wicket you try and bring the run rate down but with them, it's almost the opposite. They come in and keep playing." That is what Sammy intends to do in this series as well: just keep playing in the hope a change in fortunes can be conjured up. West Indies endured a difficult 2014, in which they lost at home to New Zealand and endured an administrative crisis. Their challenges only get bigger in 2015, starting with a World Cup in which they are expected to perform well. Sammy doesn't want to think that far ahead but sees this series as an opportunity to get the ball rolling and the music playing before they have to challenge for serious silverware.